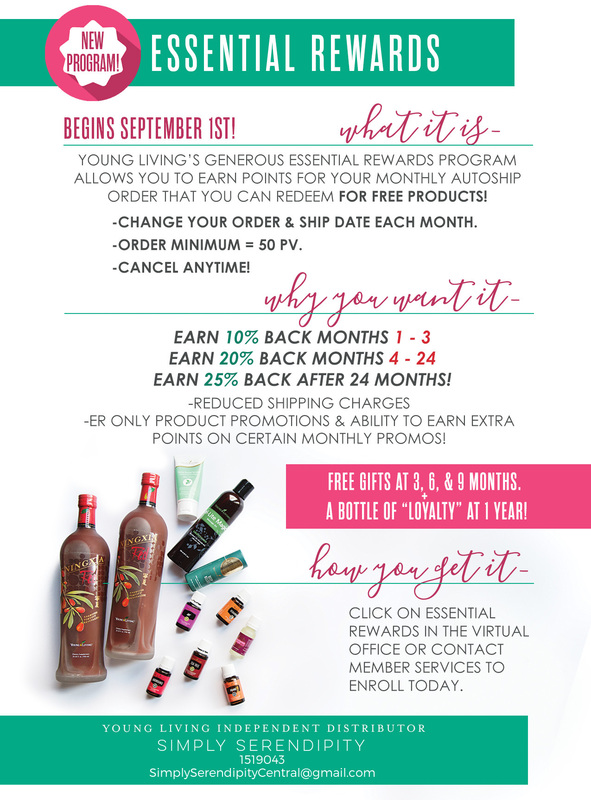 The Essential Rewards program is an awesome and incredibly generous loyalty program from Young Living. With monthly freebies and points for FREE products as well as gifts along the way, it is a great way to live the Young Living lifestyle! Available exclusively to Young Living Independent Distributors (wholesale account holders), the Essential Rewards program offers many benefits. You can also change your order each month to include whatever products you want to have. Essential Rewards members also have access to exclusive free promotional products each month with qualifying purchase. All Essential Rewards orders qualify for reduced shipping costs. Members pay a $6.98 U.S./$9.75 CAN flat shipping fee on the order’s first 5 pounds and just $0.63 per additional pound for ground shipments to the continental U.S. and $0.70 per additional pound for shipments to Canada. For air shipments to Alaska and Hawaii, Essential Rewards members pay a $12.50 flat shipping fee on the order’s first 5 pounds and $1.25 for each additional pound. Seriously, the best part of the ER program! Earn points toward future product purchases with every Essential Rewards order. As your months with Essential Rewards increase, so do your rewards! They add up fast and lead to free products! Get a thank you gift from Young Living at month 3, 6, 9, and 12 then every year thereafter on your anniversary! How do you sign up? Easy! Sign in to your back office at: YoungLiving.org. Click on Essential Rewards in the lefthand menu. It will talk you through it! Yep, it’s that easy! Enjoy the videos below if you want to see a set up and get a tour of your Essential Rewards account. Be sure to also set up your PV Assistant while you are back there!